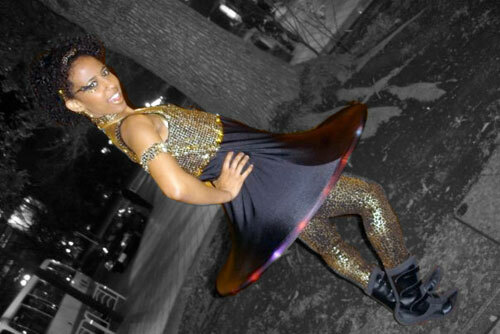 Leila rocks her hoopy dress with an LED hula hoop in the hem. I made this bouncy dress for a friend who had a mission. I can't reveal what the mission was, but the dress was so fun that I want to share the technique with you. It's not a pattern, per se, as the dimensions will vary depending upon your fabric and hoop size. 2 meters 4-way stretch lycra, a bit more if you want a longer skirt. The trickiest bit of this process is calculating how wide the dress has to be at its widest point and along the bottom hem curve. You need to know how stretchy the fabric is and how big the hoop is. If you have a tank top pattern that you like, trace it out and adjust it to be empire length so that it ends just under the bustline. For a relatively flat chested girl like me, that's about 12 cm under the armpit. 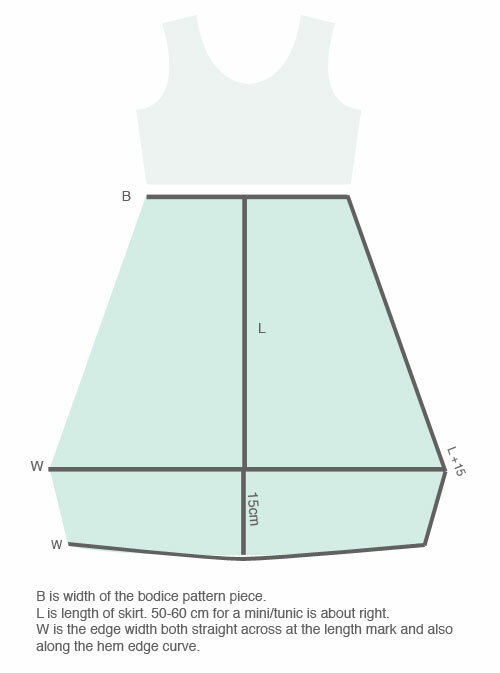 If you don't have a pattern you like, you can trace around a finished tank top that fits well. Don't forget to add a bit for seam allowances. Cut two tanks (4 pieces total) - one in the outer material and one in the lycra for a lining. 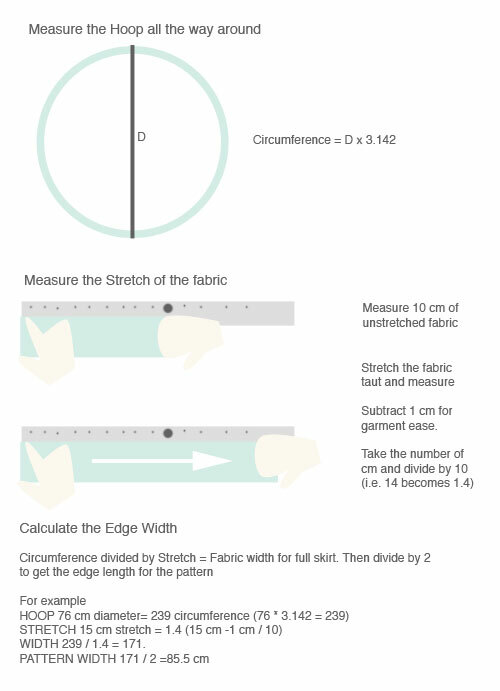 For the skirt, you'll do a bit of measuring (see below) using the calculations you did a few minutes ago. Pattern paper or newsprint comes in handy here! Don't forget seam allowances but you won't hem the skirt. When you have the skirt pattern measured and drawn, cut two pieces from lycra. Don't forget seam allowances. I use a serger/overlocker, but if you are using a regular sewing machine, be sure to use a zig-zag stitch to allow for stretch. First construct the lined bodice. 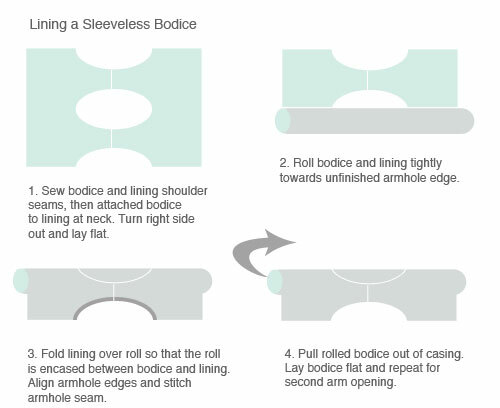 Sew the outer bodice together at the shoulder seams. Repeat for the lining. With right sides together, sew lining and bodice together around the neckline. Turn right side out. Here is a nifty magical trick that lets you sew the armhole seams. Follow the diagram below. The neck adn armhole seams will be enclosed and the side seams will be open when this is done. Sew the left side of the skirt together. Sew the skirt to the bodice, matching the side seams. If you are going to trim the dress along the bodice edge or at the hemline, do it now while the dress is flat. Sew the left side from hem all the way up the bodice and bodice lining. Slip the hoop into the dress and stretch the bottom hemline over the hoop. This can take some fussing, yanking and pulling as you want the hoop to be centered in the dress. You will have about 15 cm of fabric under the hoop as a shelf to hold the hoop in place. Brilliant. You did an amazing job with the patterning for this. I love how the dress looks on her too! Fun!